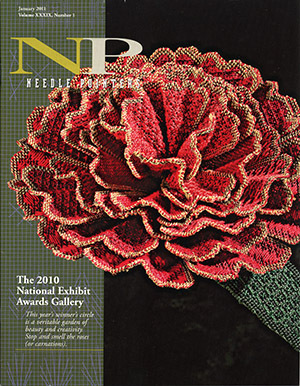 Weeks Dye Works beautiful wool felt is used in the design chosen for the cover of Cross Stitch & Needlework Magazine's March 2012 issue. 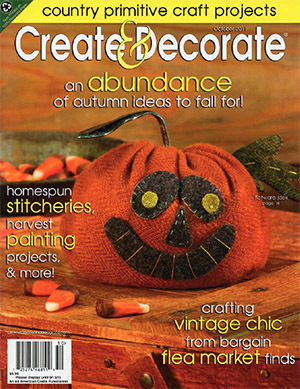 The design, by Lynda Watkins & Angie Williams of Fresh Threads Studio (Full Circle Designs), was chosen for the cover and incorporates several colors of Weeks Dye Works' wool! Miranda Weeks McGahey grew up in Willow Spring near Raleigh, NC, the oldest of six children whose ages span 23 years. Both sides of the family have been avid supporters and role models. She learned to sew and knit from her dad's kin, to make pickles and can vegetables with her maternal grandmother. Miranda has always identified herself as creative, enjoying art and music from childhood. She drew outlines of houses in the dirt, built forts in the woods, and played elaborately detailed games of pretend. There was little TV, but lots of reading; self-reliance and creativity were built into playtime. Miranda earned a degree in environmental design with a fiber arts concentration from NC State University College of Design (then called School of Design). She met her husband while in an architecture program, but switched to textiles after realizing that she wasn't "a 3D person." She took traditional techniques like weaving, embroidery, and quilting in new directions, often with nontraditional materials like plastic strips from cassette tapes. She discovered that dyes were what she really loved, the most important element in her projects, but at that point had no idea that she would someday turn it into a business. John and Miranda married in December 1992 following graduation. They lived in Denver for two years, and for her day job, Miranda dyed fabric for a couple who sold bundles of fat quarters at quilt shows. John worked very long hours, so in her free time she dyed fabric for fun and personal use. They had to move to a two-bedroom apartment to make room for all of it! After being given a card with hand-dyed fabric on the front, Miranda began to make her own greeting cards, selling them through high-end shops. 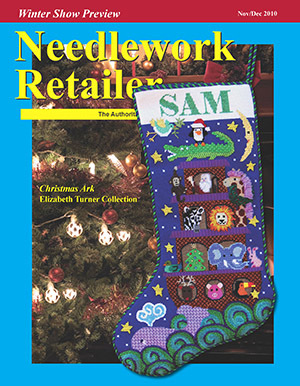 One day in 1994, she walked into a store called Ewe & Eye & Friends, thinking it was a gift shop that might want to sell her cards, but it was a cross-stitch studio owned by well-known cross-stitch designers. They weren't interested in selling her fabric or cards, but wondered if she'd dye threads for their kits. They asked her to commit; if they'd take a chance on her, she had to be prepared to fill orders— and lots of them. She said yes! Miranda dyed threads and more threads, thinking about it this way: "Wow, we can get a mattress. After the next kit we can get a sofa." So that her threads would have a separate identity, the shop owners encouraged her to name her company. She chose Weeks to include her maiden name and launched Weeks Dye Works in 1994. Wisely, she chose a name that would allow her to expand beyond threads at some point. "I thought I might want to dye fabrics again, or perhaps hats or shoes," she said. When they moved back to North Carolina, John continued as an architect and Miranda worked for the legislature. She ran voting equipment in the house chamber and enjoyed the regular hours and excellent benefits. But things changed when the two decided to exhibit Weeks Dye Works threads at a wholesale-only trade show in Charlotte in 1995. "We signed up late and our booth was at the back corner," Miranda said, chuckling at the memory. "It was a modest display with a bowl of hand over dyed floss sitting on a tablecloth. If I'd seen the rest first, I would have been too intimidated, so it's a good thing we went in not knowing what to expect. John brought me a big bouquet of flowers for encouragement." From the first day, people came by to take samples and by the third day, they'd run out. She took enough orders to work full-time for six weeks, so she took a chance and quit her job. "I never had to go back and get another job. I'm not a bold person, so it’s kind of funny that I came home and quit a good job," Miranda reported. "John was so encouraging, he knew I could do it. I was scared, but when I realized that I could always get another job if I didn't do well, I decided it would be fine. It gave me confidence and peace of mind. I hadn't borrowed any money. 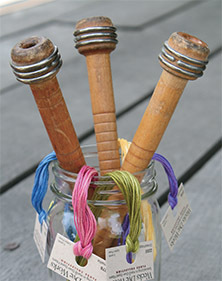 I bought skeins of floss and over dyed in the kitchen in plastic bowls; clothespins kept things together. But I knew I had to control the recipes and formulas. 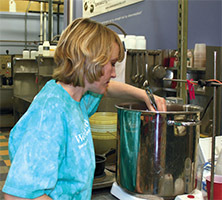 I moved to buckets and the bathtub so I could work in bigger batches." Weeks Dye Works began with about 50 muted "sampler" colors, but soon expanded when stores requested a larger and brighter palette. John renovated a room on the back of their house, and with a big sink designated for dyes, Miranda could move out of the kitchen and return the bathtub to its intended purpose. When the business outgrew the new room, they renovated the garage and hired one person, then three more, all part-time at first. By 1999, Weeks Dye Works had outgrown the garage as well. After what Miranda calls their "initial baby steps," they moved to a warehouse facility, occupying one of five bays before taking over the entire building. John's architecture firm now shares the space, allowing him to wear two hats without having to commute. The couple work well together and each is quick to praise the other's talents and abilities. Miranda is the color artist and John the business idea guy. He devised a way to work from cones rather than from precut skeins. And he had the vision to see that they needed to start with white floss, dye the base color, and then hand over dye the tone-on-tone and multishade colors. Production went from 800 yards dyed in a bowl to a facility with over a dozen employees who can dye 6,500 yards, or 1,300 5-yard skeins, in a single dye bath. After several years dyeing solely floss, Weeks Dye Works added pearl (or perle) cotton; crewel wool launched in 2010. In addition to threads, they also hand over dye wool fabric, linen, and weaver's cloth. "We don’t have every color available in every line, but wherever there is overlap, we make the end color the same and give it the same color name whether it's floss, linen, weaver’s cloth, or wool fabric so it won't be confusing," Miranda said, justifiably proud of the accomplishment. Life for the McGaheys is as colorful and varied as their skeins of floss. Sophia, Morris, Sally, and Michael were born after the business moved out of the house. The renovated garage is now a home office and creative studio for Miranda which lets her be with the family more of the time. She and the children planted a small garden this year, largely so that they could make pickles just like Miranda did as a little girl. Given how much she loves creating colors, it should be no surprise to hear that on her days off, Miranda often mixes dyes just for the fun of it. She dyes T-shirts with the kids and doesn't worry about dye recipes that need to be consistent. Off-shore fishing, boats, the beach, and the water occupy the family's free time, too. 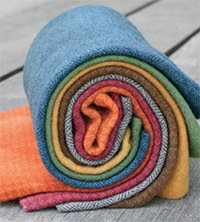 It's not just the garden that is sprouting in 2011; be sure to visit the website for free patterns, project ideas, tutorials, and a convenient store locator guide. Weeks Dye Works threads can be used for cards, scrapbooks, journals, and other paper crafts, plus mixed-media projects, embroidery, needlepoint, knitting, and more! 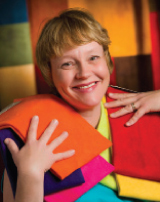 Miranda Weeks McGahey began her career dyeing fabric for a quilt company. Because her husband, John, worked long hours, she had time on her hands. So she expanded her day job to playing with dyeing fabric at home. One can only imagine the colors of her bathtub, which held those dye baths! The dyed fabrics accumulated as her fun, expertise, and knowledge increased. Then a needlework shop told her that that they could not use her gloriously colored fabrics, but might be interested in dyed threads. The experimental threads she supplied to the shop were a success. And Miranda was off on a new avenue. From 1994 and dyeing threads and materials in a bathtub, Weeks Dye Works has grown into one of the most respected companies that specialize in hand overdyed threads and fabrics. And from one rainbow hued tub, they now have a large dedicated facility, 19 employees, and do multiple dye baths a day of 13,000 yards each. Quite a record of growth! Of course, I was familiar with Weeks Dye Works, most stitchers are. But when I first heard that they were going to have spools of two- or three-strand cotton floss, well, all I could think of was, "How lazy can a stitcher be? How much work is it to strip a couple strands from the full strand?" Then it hit me. By having the two or three strands dyed together, rather than stripped out of a full six-strand, the stitcher could be certain that the variations on those two or three would come at exactly the same place. No more trying to match up the changes. What a logical approach! Of course the colors of these 2-Strand and 3-Strand overdyed threads from Weeks Dye Works are as spectacular as we've to expect from the company. Equally fantastic are the overdyed colors of their Pearl 3, Pearl 5, Pearl 8, Pearl 12, 6-Strand Floss, and Crewel Wool. My photo shows examples of the 2-Strand, 3-Strand, Pearl 12, And Crewel Wool. In addition to these beautiful overdyed threads, they also have overdyed fabrics such as linen in 20, 30, 35, and 40 counts, and a wool which, while not countable, is really wonderful. I found several colors that I'd love to have made into a skirt! Next time you're at your local needlework shop, do yourself a favor and take a look at these Weeks Dye Works items, especially their 2-Strand and 3-Strand Floss. over Anchor, Caron, Janlynn, J & P Coats AND even DMC! The company is still growing and still selling, and McGahey attributes its success to being a part of the craft industry, which tends to weather economic downturns well, as people look to more frugal hobbies and inexpensive gift-giving options. "The single fact that has most helped us weather the recession is just the fact that we're in crafts," she said. "Even if people aren't traveling or going out to eat as much, they'll still do crafts." Also, Weeks Dye Works' products - thread and fabric - are the "consumable" portion of the craft industry, so even when consumers use the same pattern or design over and over, they have to buy more thread and fabric to complete a project that second and third time. In addition to being well-positioned in their industry, to adapt to the new economic environment, Weeks Dye Works has been a bit creative. McGahey said they are experimenting with different package sizes - selling single skeins of thread instead of a pack of two, for example. These little changes have helped the company stay ahead. And it continues to expand, with new colors and new products. McGahey said adding new colors twice a year generates a lot of sales. "We pretty much have to offer something new on a regular basis," she said. "Used to be it could just be a new color, but now it has to be a whole new product line." While the company doesn't currently offer a product for knitting or crocheting, McGahey sees that as where Weeks Dye Works is headed. "For 10 years, all we did was thread, and it was fine. But cross-stitch isn't as big as it used to be, so over the last five to 10 years, we've had to get more creative and offer different products," she said. "For our future in general, I think that will be the trend; we'll always have to offer something new to keep us set apart from our competitors." 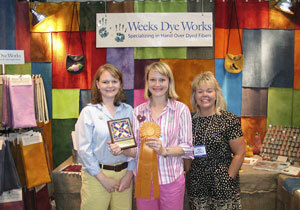 The "Best New Exhibitor Award" was received by Elizabeth, Miranda and Jennifer at the 2004 International Quilt Market in Pittsburgh! 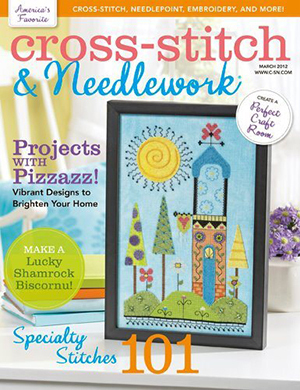 exclusively for subscribers of Just CrossStitch Magazine. When Miranda Weeks McGahey received her degree in design with a concentration in fiber arts from North Carolina State University, she never dreamed that the dyeing of textiles she enjoyed so much as a student would eventually translate into a successful business in the cross-stitch industry. "My husband says that I got a degree in a hobby," Miranda quips. "I am happy to be doing what I want to do." After graduating from college, she went to work for a fabric company and tried to sell hand-dyed muslin to the ladies at Ewe & Eye & Friends. They were not interested in the fabric but suggested that Miranda dye some six-stranded embroidery floss for them. The cotton floss became part of a kit; and the rest, as they say, is history. What "started just for fun" three years ago is now known in the needlework industry as Weeks Dye Works. The Weeks Dye Works line of overdyed floss now consists of 121 colors available in five-yard skeins with such interesting names as Peoria Purple, Scuppernong, and Neapolitan. The ideas for color names come from nature or places but mostly reflect a Southern influence and a good dose of humor. Miranda states, "The floss is 100% cotton [Anchor] . . . and hand overdyed [by Miranda and an assistant]. We do rinse the floss very well, but it is not guaranteed to be colorfast. This has not been a problem...."
While the inspiration for the colors comes from her own preferred palette, she also relies on input from designers and stitchers. "I came out with yellows last year because I realized that I had several golds but no real yellows," Miranda shares. "The most fun is coming up with new colors!" She points out that her floss line can be divided into antique, muted colors and true colors. The top-selling shades are Blue Spruce and Brick, followed by Carrot and Charcoal. Miranda is proud of the good range of colors available from Weeks Dye Works. She is quick to state that there is a nice variety of "brights, darks, and subtles." Although there is a definite variegation, the colors "blend naturally when stitched" to achieve "a dimensional look." Miranda recommends adjusting stitching technique to the color. For example, if a blended appearance is desired, complete each cross stitch before moving on to the next one. "It's okay to experiment," she reassures stitchers. "Stitches just come to life-each time it's new." She goes on to say, "It may seem crazy, but I still get excited when people use it for the first time and write to say how much they enjoy working with it." It all began in a bathtub in an apartment in Denver, Colorado. Maybe you have seen these rich, variegated colors of Weeks Dye Works threads in your local shop. They are a six-stranded, cotton based thread which is space dyed. This means sections of the thread have been dyed a different color which repeat throughout the length of thread. Many designers say these are some of the most vibrant threads on the market today. Even the names are enticing such as White Chocolate, Conch, Hydrangea and Moonglow. But as alluded to, it is the story behind their creation which will endear you to them. Once upon a time, Miranda Weeks wanted to be an architect, so she attended North Carolina State to pursue her ambition. Along the way, the school required her to take a course outside of her major. She elected to take a semester in the study of textiles. In her classes she learned to screen print, dye fabric, weave and sew. Miranda enjoyed this tremendously. She never returned to architecture. Soon after graduation, she followed her future husband John McGahey ( who she met in college) out to Denver, Colorado. She took a job dyeing fabric for a quilt company. 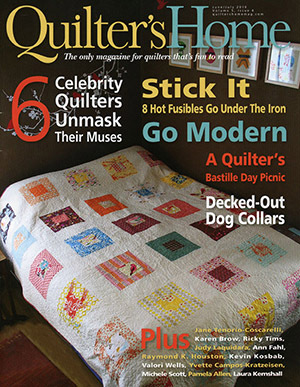 Meanwhile, her husband's long work hours left her with time on her hands, so she took up quilting. Boredom began to set in, so she decided to try her hand at dying fabrics for her quilting just for fun. Soon, her husband made the comment that Miranda had so much dyed fabric, she would have to sell some of it off. And so she did. She sold some to a quilt company, and then went door to door to textile oriented shops in Denver. In one shop she visited, Ewe & Eye & Friends, a cross stitch shop, the ladies loved the colors of the fabric but didn't have a need for it. They asked if she ever considered dying thread. Miranda had never thought of it, and decided to give it a try just as a hobby. When she returned to the shop, one of the owner's loved the thread and ordered several hundred skeins to be kitted in one of their designs. Then other shops began to call Miranda. What had begun as a hobby was beginning to turn into a real venture. Miranda came up with a name for her budding company using her maiden name Weeks and adding Dye Works since that is exactly what she does. In 1994 the McGaheys returned to North Carolina. 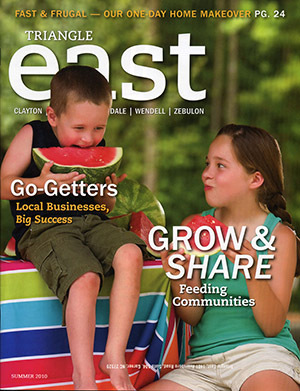 They live outside of Raleigh in Fuquay-Varina. Miranda decided to give up her job working in the General Assembly for the North Carolina Legislature to pursue dyeing full-time. The dyeing process has now moved from Tupperware containers in an apartment bathtub to photography sinks in a converted garage. The baths which create the thread colors has grown from a few 50 yard baths a week to a few several 4,000 yard baths a week. Miranda has 130 colors she concocts using a "recipe" book to keep colors consistent. "Of course there are no guarantees" she adds "because everything from the temperature of the water to the humidity plays factors" . She recommends that you not wash the threads as it will fade the colors. "Never wash any reds or even the burgundies as they are most likely to bleed" she warns.